RADspeed Pro EDGE - Radiography 《SHIMADZU》 - X-Ray Sytem - Product - The Industrial Promoting Co. Ltd.
RADspeed Pro EDGE package is top-of the line General Radiography System in Shimadzu RADspeed family, which is featuring a variety of the latest cutting-edge applications like Tomosynthesis, Speed Stitch or Dual Energy Subtraction. Tomosynthesis is a new digital imaging technology that combines cone-beam CT reconstruction with digital image processing. It allows images of any cross section to be obtained easily from volume data acquired from a single tomographic scan. This allows images to be obtained with loads applied in the standing position, or in the supine position on a table. Consequently, it can be used to obtain images of the elbow or knee in the bent position, which is difficult using CT.
Tilting the tomosynthesis cross section slightly from horizontal improves the visibility of spines, hip joints, and other areas that are not parallel to the tabletop. “T-smart”, Tomosynthesis-Shimadzu Metal Artifact Reduction Technology, is our latest and highest grade tomosynthesis technology evolved further to reduce the metal artifacts with iterative reconstruction method. T-smart is useful especially for the prestigious orthopedic customers who are treating a lot of joint replacements with metal implants because T-smart is effective to see the adhesion degree between bone and implant. 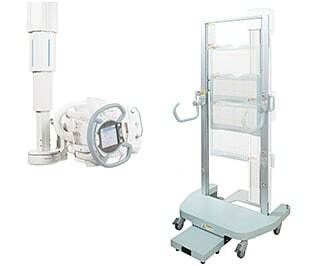 The X-ray tube swings and the FPD moves automatically to capture image data. The captured image data is then automatically stitched together in the DR system. This makes it easy to create long images that extend across larger areas of the body in the anteroposterior direction. Speed Stitch function is available both in supine position and in standing position. By taking successive high and low voltage images and applying a calculation process, soft-tissue images and bone images can be viewed separately. Shadows of nodes obscured by ribs can be rendered in soft-tissue images, or calcification can be rendered in bone images. 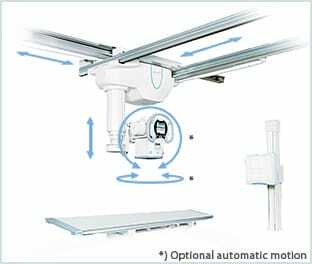 Pressing a single button on the remote control smoothly moves the ceilingmounted X-ray tube support to preregistered positions. Movement stops immediately after the remote control button is released. Up to two remote control units can be used. 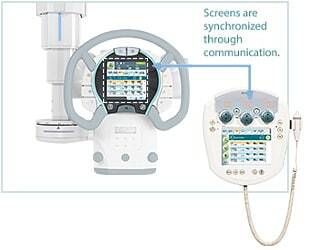 Radiography parameters can be changed beside the patient as well as on the wall-mounted console in the control room. The operator can prepare for radiography without leaving the patient. This sophisticated synchronization of the X-ray tube support and X-ray high voltage generator effectively exploits the convenience of dual consoles. Select a protocol to suit the type of examination, and the filter in the collimator will change in accordance with the protocol. This ensures the correct filter is always automatically selected. Remove the grid during pediatric radiography to reduce patient exposure. The type of grid inserted is displayed on the integrated console and on the LCD on the ceiling-mounted X-ray tube support. For dose monitoring, either a Dose-Area Product Meter (DAP) or a Calculated Dose is available. The DAP measures the actual dose and displays it on the DR operator’s console. The Calculated Dose displays the expected dose, in advance of the exposure, based on the radiography parameters and the distance to the patient. After the exposure, the calculated dose, based on the actual exposure arameters, is displayed. With either option, the resulting exposure parameters and dose are displayed and can be sent to the RIS/PACS system.